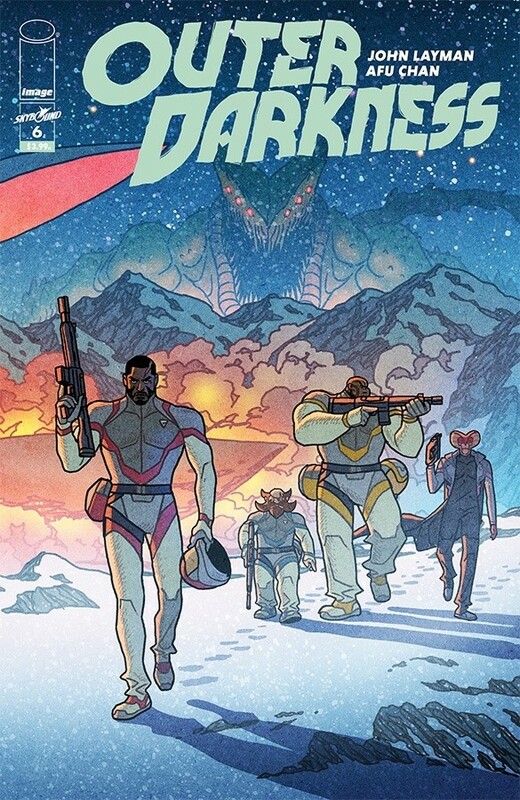 Outer Darkness #6 – As the first arc ends, we see just how the crew of the Charon is going to free themselves from the attentions of two different demons, and get their ship back up into space. As with every issue of this delightful series so far, some of the best parts of this comic involve watching characters make decisions that will have long-term negative consequences, if not for them, than for others. I consider this my favourite title right now, and am so pleased to see that each new issue has not disappointed. John Layman and Afu Chan have really tapped into some cool concepts with this book, and I can’t wait to see where the next arc takes us. Age of X-Man: Marvelous X-Men #3 – I think I’m done here. I’ve been liking what Matthew Rosenberg has been doing in Uncanny X-Men, and for that run to work, almost all of the X-Men have had to go away. Unfortunately, Marvel being Marvel, needed to create five or six miniseries set in an alternate world to show what the rest of the mutants have been up to. This felt like the flagship series, and being written by Zac Thompson and Lonnie Nadler, I was very intrigued to see how it was going to work. Unfortunately, the premise of Nate Grey creating a Utopian world for the mutants to live in, but one that was predicated on a lack of intimacy, makes no sense. It’s kind of boring to watch the X-Men run around saving people from natural disasters, especially when the people they are saving are all mutants who presumably have abilities themselves. That Storm and Magneto are starting to figure things out, just as Apocalypse spearheads a movement base on love, seems forced. I don’t think I’m going to bother reading the rest of this series. I have loved just about everything I’ve seen of Nadler and Thompson coming from independent publishers, and enjoyed their Cable run, but this is just not for me. 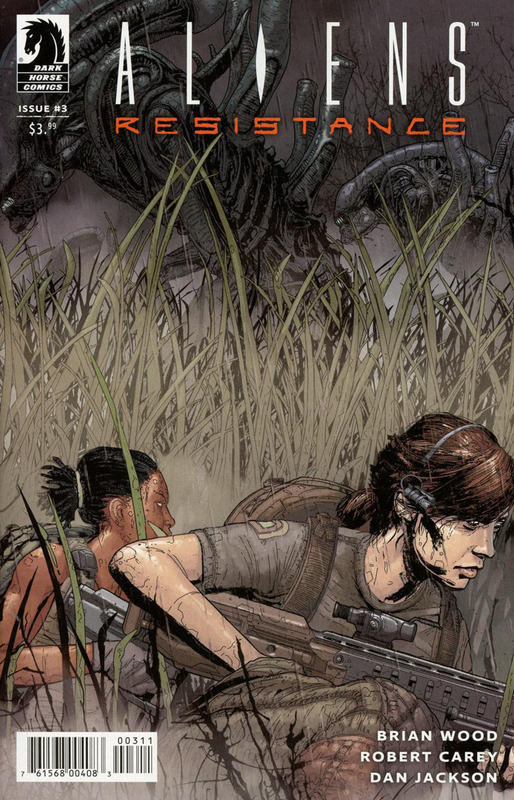 Aliens Resistance #3 – Brian Wood is carving out his own corner of the Aliens universe, and it works pretty well, even if his writing is not always the clearest. This series often confuses me, but it’s intriguing. Infinite Dark #5 – I’m surprised that this series has made it to a second arc, as the first didn’t leave room to continue until the very end of the fourth issue. Now, the few survivors of the human race find themselves in a more precarious position than ever, and Deva, the head of security on the space station where they live has to figure out what’s going on in her own head. This book is creepy, but I’m not sure that I’m fully grasping everything that is going on here. I might need to give this a second read. Invaders #4 – Chip Zdarsky retcons Namor’s history pretty heavily with this issue, providing some explanation as to how erratic he’s been over the decades, and implicating Charles Xavier into the mess (because who better to have done something short-sighted and selfish, and then credibly not bother fixing it?). It’s interesting, as is the revelation at the end of the issue. Butch Guice handles most of the art in this flashback-heavy issue, which is a bit of a treat, although I also like the work that Carlos Magno is doing on the present-day art. This series is not what I expected, but I like it. 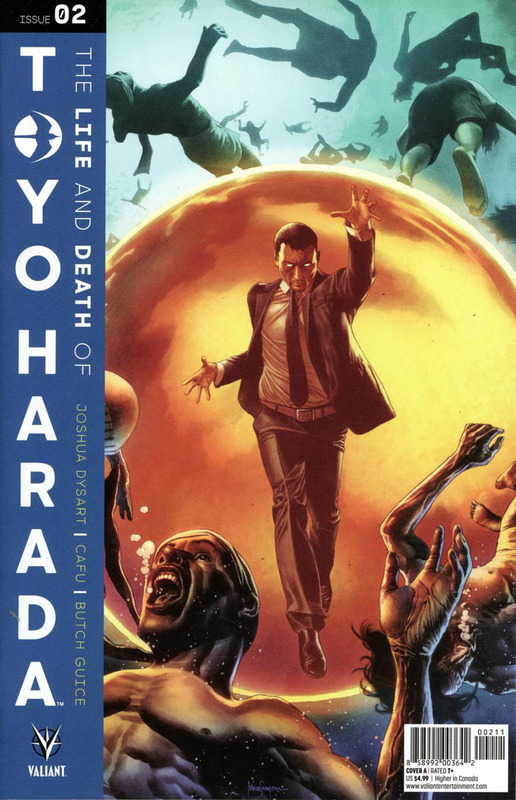 The Life and Death of Toyo Harada #2 – I’m still so happy to see Joshua Dysart return to these characters, and finish his long story. In this issue, the Angela Vessel makes her move against Harada (because he’s been stifling her monstrous research), while Toyo appears to be reevaluating his aims. This is a very well-written comic, and is the second this week to feature flashback art by Butch Guice. I see this as the culmination of Valiant’s line. Livewire #5 – It appears that the Harada Foundation has been replaced by a new organization that exists to track and train young Psiots – the Psiot Safety and Education Program. When Amanda goes looking for a girl whose parents believe her to be missing, she comes across this organization. I’m not sure, at this point, that writer Vita Ayala is doing anything new with Amanda’s character – it feels instead like revisiting old dynamics in new settings. I’m still not convinced there is a strong vision for this series, but I’ve been enjoying it well enough to give it a little more time to impress me. Low #21 – Stel and Zem are now prisoners of the inhabitants of the Black Dome – humans who have evolved after staying on the radioactive surface of the Earth. They are displayed in a zoo-like enclosure, and studied, while the army of the Black Dome prepares to hunt down the remaining humans under the sea and destroy them. Stel remains optimistic, which is what makes her such an interesting character. This book has been on hiatus for so long that it’s a little difficult to get back into, but I do like Rick Remender’s writing and Greg Tocchini’s art a great deal, and am happy to see that this looks like it’s back (although, really, all of Remender’s books are hella behind schedule at the moment, so who knows). 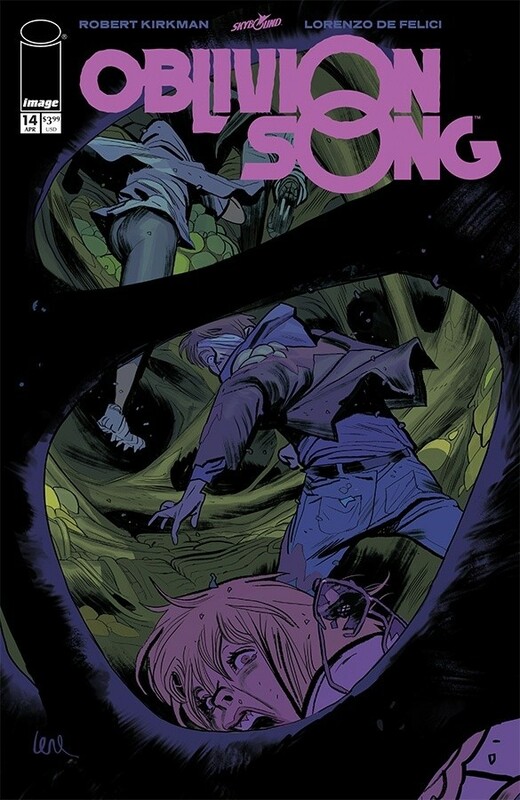 Oblivion Song #14 – Last issue, this series jumped forward a few years, and we are continuing to learn about how the status quo has changed. The mystery of the Faceless Men on Oblivion deepens, while on Earth, Nate gets the chance to see how the world really sees him, which goes a long way towards assuaging his guilt. This book has been meticulously planned, and has me pretty hooked. Winter Soldier #5 – I enjoyed this miniseries. The last time Bucky got his own book, it was pretty insane (I mean, it was by Ales Kot and Marco Rudy), but this one is much more grounded and focused on Bucky’s attempts to help a young kid who was trained by Hydra to be an assassin. Kyle Higgins keeps the story suitably complicated, and Rod Reis provides some of the least stiff art I’ve seen from him. I’d like to see Bucky’s character get explored a little more somewhere – I’m not sure how long the Invaders is going to last or if it’s ever going to treat him as more than a supporting character. 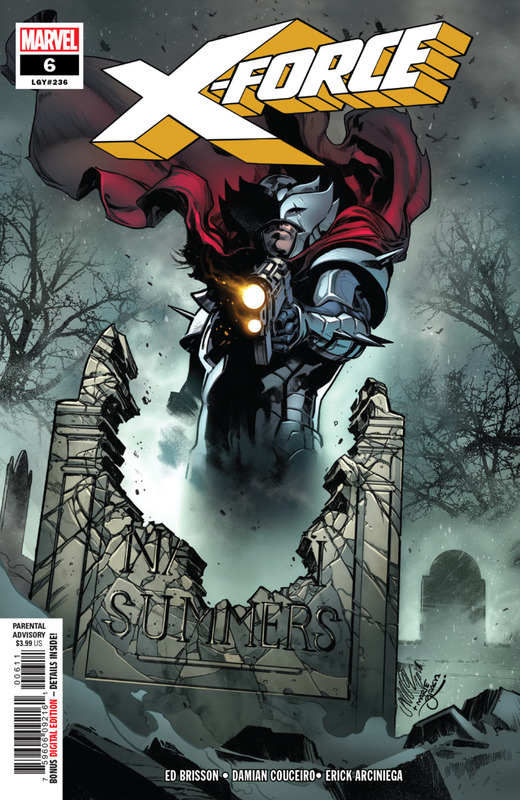 X-Force #6 – As Ed Brisson and guest artist Damien Couceiro continue with their exploration of the pertinent backstory, we spend time with Teen Stryfe, and learn just how he came into contact with the Transian leadership, and what he’s done with Rachel Summers. This issue sheds a lot of light on what’s happened in the background leading up to now, and lays the groundwork for where the book is headed next. I miss Dylan Burnett’s art, but think he’s back with the next issue, so it’s all good. 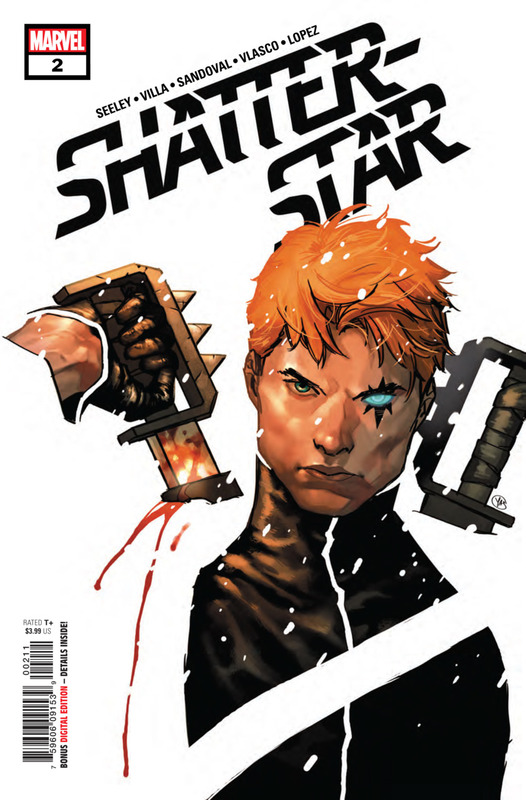 Shatterstar #1&2 – I’m not a fan of Shatterstar, but did like the way that Peter David added depth to the character in X-Factor. This miniseries gets an interesting start, as Star gets a name, and a job as a landlord, before having to go rescue his interdimensional tenants from an old lover who has kidnapped them. I like that Tim Seeley is working to acknowledge his relationship with Rictor, and make it more complicated, but I’m not sure how this jibes with the new X-Force series. Snotgirl #11 – I am beginning to regret that I’m not reading Snotgirl as soon as it comes out. This title has a real charm to it, and I’ve grown to really like the characters, even the awful ones. If this came out reliably and regularly, I would be adding it to my pullfile. As it is, I’ll just keep getting it eventually, as I have a better chance of reading some issues together. Spider-Geddon #4&5 – This event miniseries ended quite well, with some much-needed clarity on just what’s going on with the Superior Spider-Man. I don’t really understand the Inheritors as characters, but it’s cool to see so many different Spider-Characters coming together to fight them. Now that Marvel’s gone to this well twice though, it should never happen again, or at least for at least fifteen years. West Coast Avengers #2-4 – Okay, I should be reading this book regularly. Kelly Thompson has hit on a great formula with this oddball book, pairing a terrific lineup (Two Hawkeyes, Ms. America Chavez, Quentin Quire, Gwenpool, and a newer character) with her sense of humour and Stefano Caselli’s great character-based artwork. The new team fights off BRODOK in the first arc, which was great fun. I really didn’t know this was so good. It’s time to get caught up on it. Cannibal Vol. 1: I loved Brian Buccellato’s Foster, and was curious about his new Image title. The first four issues are included in this trade, and that feels like an arbitrary decision, as there’s not really an arc to these comics. In this story, it seems that there’s some kind of disease that has turned some people into cannibals – they appear normal until their hungers take over. There’s no way of testing for the disease, and so people are uneasy with one another. 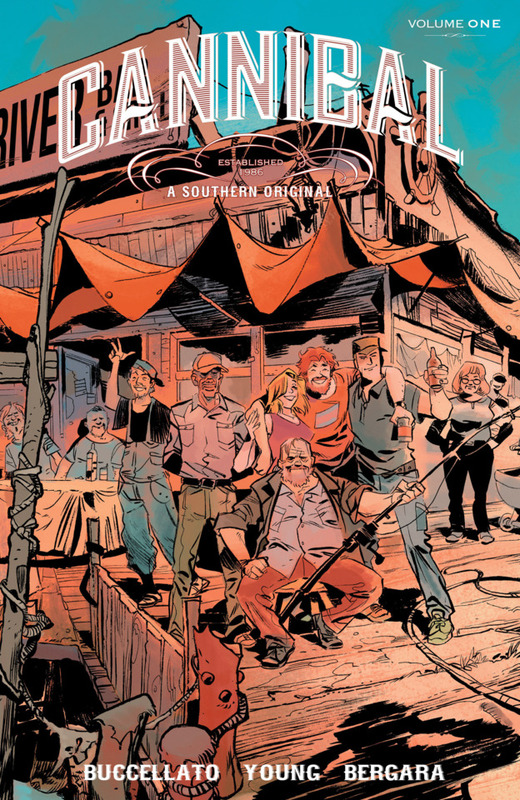 The story takes place in the deep south (that ended up being a theme this week – see below), and we are introduced to a cast of characters that are more or less just getting through their life. One is worried when his girlfriend goes missing. Another guy has just come home after a long time away. My problem was that I couldn’t really figure out who people were or what their relationship to one another was. The facts of the disease are just trickled out, and I found the back cover’s synopsis essential to understanding what was going on. This book needed some more editing. At the same time, I’m interested in this story, but I’m not sure that, if I were to wait more than a couple of weeks before reading the next trade, I’d have any memory of who is who. Gasolina Vol. 1: Bienvenido – Much like Cannibal, there’s some cool stuff in the first trade of this series by Sean Mackiewicz and Niko Walter, but it took way too long to establish itself and its characters. There is a couple (he’s American but I think she’s Mexican) who live in Mexico, trying to escape their violent pasts. They run afoul of some demonic plans being enacted by a local cartel, and there are creatures that live inside people’s’ chest cavities. The end of the book shifts all the action onto a Mexican cop, and that part is interesting, but really, I was kind of lost. I did take a break of a couple of weeks, halfway into the volume, but really, this was serialized as a monthly so that shouldn’t make me so lost. Redneck Vol. 1: Deep In The Heart – I’m still getting caught up on Donny Cates’s back catalogue, which I slept on way too heavily. 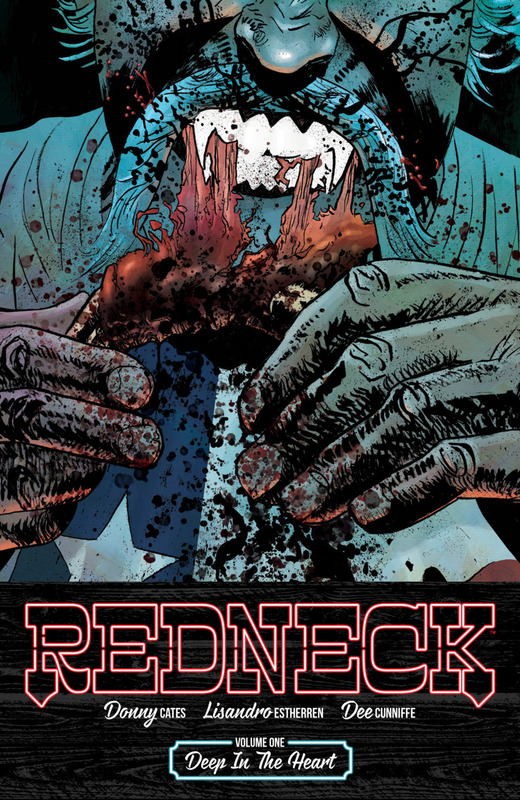 Redneck is a cool Image comic about vampires living among people in Texas. The Bowman family have been living peacefully for decades, surviving off of cattle blood and selling beef through a restaurant they own. Their long-lived feud with a local family heats up again, as the vampires have to face the truth of their nature, which does not want them living too civilized for long. This is an interesting, character-driven story, with great art by Lisandro Estherren, which reminds me a bit of Eduardo Risso’s work. I’m in on this series, and am glad I’ve already got the second trade sitting in a pile waiting for me.